Winter is officially a month away, but you might have already seen the first snow. As the temperatures drop and our heating bills rise, remember the dos and don’ts of heating your home efficiently this winter. Clean furnace filters save you money and increase the life of your HVAC system. Clogged or dirty filters cause your furnace to work harder and wear out faster due to decreased airflow. Replace filters every one to six months depending on the type of filter and your environment. Follow the manufacturer’s directions. Scheduling your annual furnace tune-up supports long-term, maximum efficiency for your heating equipment. Our team will clean and check all critical components, ensuring your furnace will run smoothly all winter long. 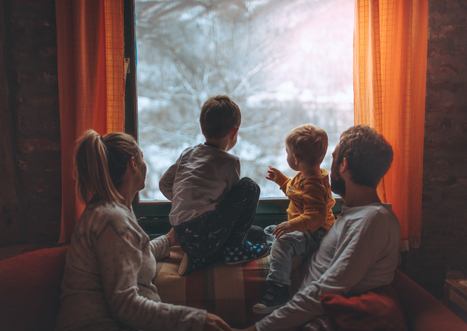 Winterizing your home reduces drafty, cold air, while keeping the warm air inside. Double check that you have sufficient insulation for your walls and ceiling. Insulate doors and windows with weather stripping, caulking materials, or a draft stopper. Lastly, use rugs on any hard floors. Set your thermostat a few degrees lower than normal while sleeping and while away for an extended period. It will likely cost you more to heat the home back up when you return if you drop the temperature to save on energy while you are away. If you want to save more money on your heating bill, wear warmer clothing. Winter is the best time for home-cooked meals made in the oven. From casseroles to roasted vegetables to oven-baked chicken, you’ll enjoy a delicious meal and warm, cozy home. After you finish cooking, turn off the oven and open the door to let the heat escape. Just be cautious if you have kids or pets! If you have a zoned heating system and can control the temperature in specific areas of your home, keep any rooms that you don’t use often between 62 – 66 degrees. If your home does not have the capability to heat individual zones, seal off rooms that don’t have a supply or return air vent. Take advantage of any sunny days. Even if it’s cold outside, heat from the sun will pass through the windows. Use thick curtains to insulate the windows when it’s cloudy or dark outside. Check to see if any furniture such as beds, couches, dressers, or tables are blocking your vents. Stopping the airflow slows the heating of your home and causes unnecessary wear on your furnace. Some may think you should close any vents in rooms that you don’t regularly use, but this could damage your HVAC equipment. Humidifiers can do much more than improve nose, throat, skin, and respiratory comfort. Winter air is undeniably dry, especially when you heat your home. A whole-home humidifier works with your HVAC system to create a comfortable temperature and humidity level. You can keep your thermostat lower because humid air feels warmer. Don’t Forget to Call Hanson’s Plumbing & Heating. Our team is available 24/7 for emergency heating, cooling, and plumbing services throughout central Minnesota. Contact us today to learn more about our heating services or maintenance agreement program today!